as early as 5,000 B.C. There is a great deal of debate about who invented pasta. Was it the Chinese, Italians, or Arabs? Well, reliable sources tell us it was the Chinese who are on record as having eaten pasta as early as 5,000 B.C. 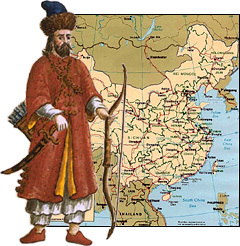 Marco Polo probably brought pasta back to Italy with him from China in the thirteenth century A.D.
What to look for when buying pasta? 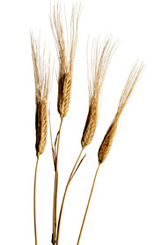 Always make sure you buy pasta that is made from 100% durum wheat. 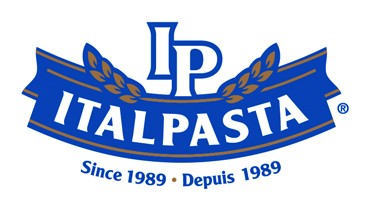 We might be a bit biased, but we also suggest that you look for pasta made with Canadian Durum. Make sure the product has a nice translucent colour and does not have any air bubbles or dark specs. How many types of pasta are there? So you think you know your pasta? The experts tell us that there are 7 key criteria that you should use when evaluating pasta. Good pasta can be recognized by its bright amber colour. The better the pasta, the less it sticks together. If your pasta turns into a ball in the strainer, it is a potential sign of poor quality pasta. Quality pasta has a matte finish with a consistent look. The Italians call this the "al dente" characteristic of good pasta. Pasta should have bounciness-it should have life when it is being eaten. You can always tell good pasta by how much chewing it requires. The more you need to chew, the better the pasta. The better quality pasta will stay separated when it is being chewed. It should not clump together. Quality pasta has a subtle nutty flavour to it. The quality of pasta can be judged as much by what you do not taste as by what you do. It's an old saying, but if you can boil water you can cook pasta. Just so you get it right, we offer a few helpful hints to make simple cooking even easier. Use uncovered 1 litre (4 cups) of water for every 100 grams of pasta. Some pasta lovers prefer that a teaspoon of salt is added to the water before bringing it to a boil. Once the water reaches a vigorous boil, add the pasta slowly. Cooking time starts from the time the water returns to a boil once again. The time it takes to cook depends upon the type of pasta. 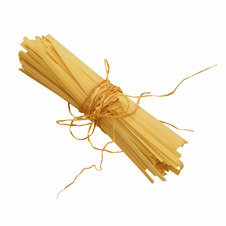 An Angel Hair pasta with small noodles typically takes less time than a thicker type of pasta such as Rigatoni. Be sure to check the package for specific cooking times. To test if the pasta is ready, you taste it. Many prefer it "al dente" while others like it more tender. Drain well and serve. The types of sauces that can be added to spice up your pasta experience is limited only by your imagination. 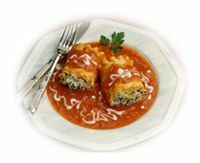 While some people like their pasta with a bit of olive oil or butter, others like it with cream or tomato sauces. Of course, there is no limit to what you can add to pasta. Chicken, beef, sausages, fish, vegetables and many other favorite foods can make great pasta even better.